"First, in jAlbum, go to Tools, Preferences, Album. Make sure that both Clean old "res" files on "make album" and "Synchronize output directory* are checked. I'm betting that the second one isn't, and that's why you've ended up with a bunch of unnecessary stuff in the output. Open the album project in jAlbum, click the little down-arrow to the right of the project name, and choose Delete, Delete local album." Don't I need to undo those actions first? (please tell me how to shade a quotation, like yours.) And don't I also need a specific destination when I upload those folder contents? Don't I need to undo those actions first? You made the album again this morning, so the album folder should be there again. Don't keep deleting it. Now that things have been cleaned up a bit, just leave it alone. And don't I also need a specific destination when I upload those folder contents? Yes. They need to be uploaded to the root of your account on your web host. In fact, most of your album is up there right now, showing a build time and date of 2/6 at 9:58 am. Almost all of the images are there, both slides and thumbs. But it appears that you failed to upload the res directory of the album, which is required to make it work. And you didn't upload the slides and thumbs directories from the top level of the album, so there are two missing images on the main page. Don't try to pick and choose what to upload. You need to upload the entire contents of the album directory. ...please tell me how to shade a quotation, like yours. Well, I tried to make an album this morning but the process got stuck - it didn't quite complete. This might account for the missing res directory, and the two missing images on the main page. Consequently when I look at my work in Filezilla I do not see an album. As for number of times I've deleted an album, it's only been once, that first time. A Newbie question on where to upload: What is the root of my account? Very sorry about all this. I'm trying to understand and sometimes it must seem I'm asking dumb questions. No, the album is there. You uploaded most of it. In jAlbum, choose Tools, Open directories, Output directory. This will show you what's in the album folder, and you can see where it is on your PC. See ss003756.png. The res directory is actually the first thing that gets created, so I don't think it could be missing. Hit Make Album again, and wait for it to finish. Maybe it would help to take a second look at my upload process... see attached. Oops... our messages crossed. I'll try loading again. I just can't tell anything from that screenshot, beyond the fact that the jAlbum uploader is failing. The album certainly exists - jAlbum wouldn't even let you try to upload it if it wasn't there. And when you preview the album locally, does it look OK? I think I got it. Rather, we got it. I tried creating and loading again and it went very smoothly this time, to completion. Don't know what was different this time. There was one hiccup... for some reason my website was scattered, had none of the look it's supposed to have. I went back to my Filezilla view and noted the res file was missing in the online list of folders. So I tapped it twice in the PC list and it got uploaded. Went to my jAlbum workspace and called up Preview - looking good. I created and uploaded again and my website was looking like it was supposed to look. How does it look to you? Are you able to look at my workspace? Does it look like it's supposed to look? Feel free. Oh, and all the folders show slides and thumbs, that's all. Nice and clean. What is that res file, What does it do? Why didn't it get uploaded along with everything else? I have a photo of my gorgeous self in a res folder in my create workspace... but that's obviously a different kind of res file. I feel like Linus having another go at the football... while Lucy deceptively holds it upright. So far she hasn't let go of the ball. Yes, the site looks fine. I can't really poke around your hosting account to see what other dragons might be lurking up there, but things seem to be clean. The former detritus appears to be gone, as far as I can tell. I do have a suspicion about why the jAlbum uploader keeps failing. 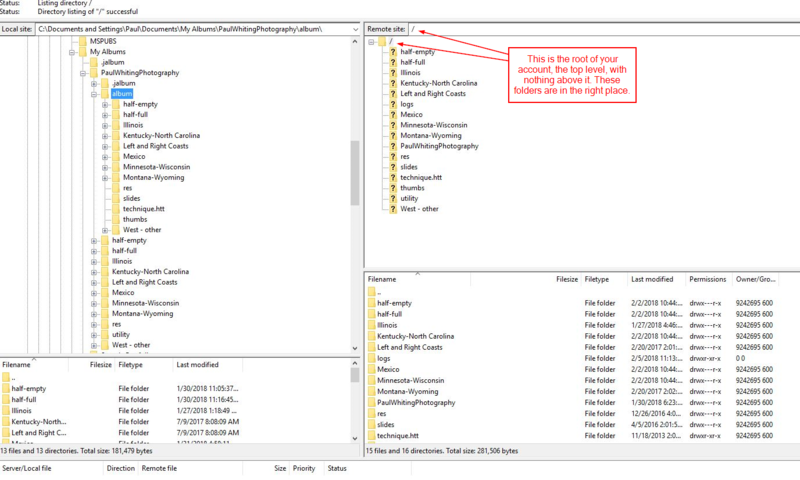 Using FileZilla, connect to your hosting account, then look at the files and folders on there (in the lower half of the window panel on the right - we need to see the files, not just the folder structure). If you see a file called manifest.jmf, delete it. The jAlbum uploader uses this to speed things up, but if that file gets corrupted, it creates havoc, and it cranks out error messages that are stunningly unhelpful. Looked for manifest.jmf where you said to look and couldn't find it. Good tip for me to keep on hand though, thank you. I found the manifest file and will promptly delete it. I don't know if it was there all along and I missed it or what. See screen shot 2. Any other files in that pane you'd suggest deleting? EG, what's that humans.txt file?!! I'm noticing everything is running so much more smoothly now, when I Make and Upload now it's much faster. I'm not weighed down with those folders within folders. Now that things are working properly, you can leave manifest.jmf there. It's created by the jAlbum uploader, and it really does speed things up a bit when you do updates. If you delete it, it will reappear the next time you do an upload, and that's fine. It's only a problem when the file gets damaged somehow. The others are all part of a Turtle album, even humans.txt, which contains some credits (who created this software, who did the translations, and so on). The only exceptions are Technique.html and technique.html. You obviously changed from lower case to upper case a few days ago, and the lower case one is a leftover. First, delete it from your PC. From within jAlbum, open the album project, then open the output directory - Tools, Open directories, Output directory. Delete technique.html, the lower case one. Then delete it on the web host, as well. Not doing any harm, but it's an orphan. I had already deleted manifest.jmf ! OK, it'll come back next upload. There was another text file I deleted, it seemed it had nothing to do with jAlbums. I checked my Recycle Bin and found it right away, it was robots.txt. Wonder what that's all about. I can easily put it back where it belongs. And right next to it was humans.txt, I must have deleted it and then jAlbum put it back. I'll take you up on your suggestion to delete the technique.html orphan. Yes, robots.txt is part of Turtle. It's not needed to make the album work. 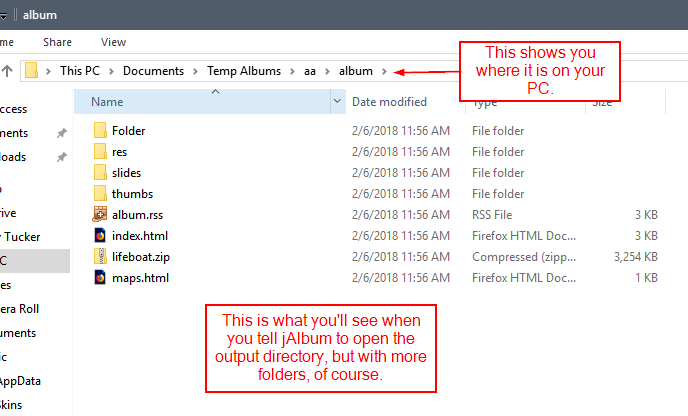 It's a file that search bots look for - the contents of the file tell the search bot whether to index this page, whether to burrow down into the folders, and so on. Well-behaved search bots like Google will respect these instructions - rogue bots just blithely ignore them. By default, it's set to tell the search bots, "Sure, come on in and index this site." I don't see anything in the Turtle settings that would alter that - perhaps Laza intends you to edit that file manually if you want some other bot controls, like "Index the top page, but don't index the folders." It's been a very helpful thread. It started on the Turtle group, but we very soon gave up on the topic of logging on to the Filezilla Forum. The thread was redirected here, a new forum for me. And jGromit began to give me many tips on how to clean up my website's clutter, making heavy use of Filezilla. Serious thread drift, when you look at the thread's title! Filezilla certainly qualified as a "Supporting application".